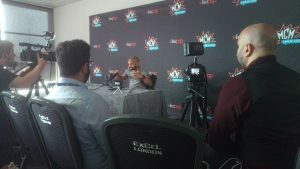 Khary Payton came to MCM Comic Con London to meet fans and talk about his roles in The Walking Dead and Teen Titans Go! As well as meeting the thousands of fans who flock to London Excel to meet the stars of their favourite shows, play the latest video games and purchase anything from comics, books, artwork to snacks from around the world. Payton talked about the amazing success of Teen Titans Go! as well as the upcoming movie as well as his experiences on The Walking Dead and his inspiration for his role. You can check out a short clip below.